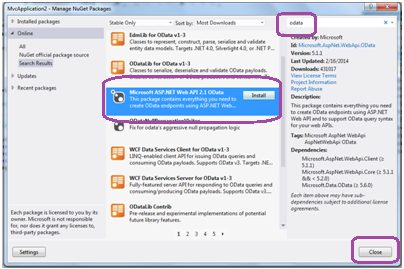 In this article we will focus on how to use the OData features in a ASP.NET MVC Web API using Visual Studio 2012. We will start by a basic introduction to OData followed by using OData features in Web API. 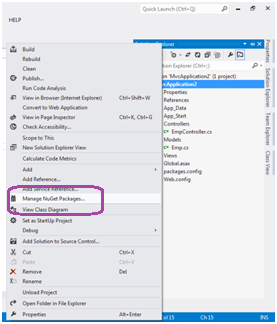 In this article we will focus on how to use the OData features in a ASP.NET MVC Web API using Visual Studio 2012. OData is a Data Access Protocol. •It supports different formats such as JSON/XML. •Using OData we can also easily expose metadata about the data which can be used by clients to discover type information and relationships between different entities. • It provides additional features on top of the basic functionality such as filtering the records based on some condition, paging, sorting, retrieving selective number of records and many more in a very easy manner. We will create a simple WebAPI OData project which allows us to perform simple operations like filtering the data, selecting first few records, sorting the records by a particular column. 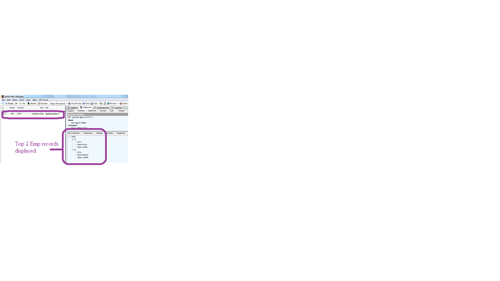 Launch Visual Studio 2012 -> File -> New -> Project -> ASP.NET MVC4 Web Application -> Select Empty Template -> click Ok. Right click Models folder and add a new class with the name "Emp". Add Id,Name,Salary properties to this class. Right click Controller folder and add a new class with the name "EmpController". Derive this class from ApiController class and Add a Get method which returns the list of Employees. We will annotate this class with "Queryable" attribute. 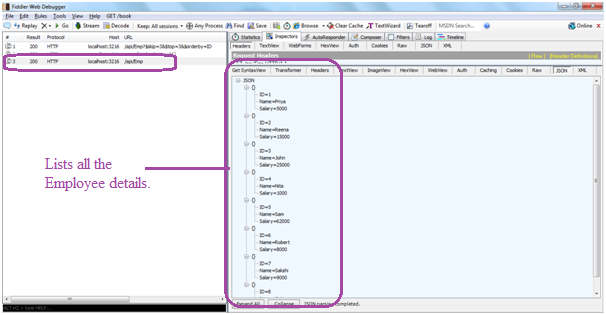 This attribute enables querying using the OData query syntax. 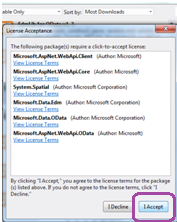 4.Click on Install and Accept the License Agreement -> click Close. Build the project and run the application. Copy the Url from the browser window. Launch Fiddler. Go to Compose tab and paste the url and append it with "/api/Emp". Double click on result on the right side. This will display the list of Emp Details. To orderby Name of the employee append the url with "$orderby=Name". This will order the results by name of the employee. To list Page 2 with 3 items per page ordered by ID of an employee. "Attempt by security transparent method 'System.Web.Http.GlobalConfiguration.get_Configuration()' to access security critical type 'System.Web.Http.HttpConfiguration' failed". To know more about OData conventions. Go through the below link.